Members of the First Congregational Church in West Boylston added a new spin to potluck dinners with their Circle Suppers. These informal gatherings allow members to get better acquainted while sharing a meal in a casual atmosphere. "These dinners really bring the congregation together," said Karen Michalak, a member of the church and the coordinator of the program. "I went to a supper many years ago and after just one meal I found a lasting relationship with the people I met. This is why I am passionate about keeping them going." The suppers consist of different groups of adults getting together at a host couple's home. The host provides the main dish, rolls, and coffee/tea. The other participants -- usually 3 or 4 other couples -- provide the vegetable, salad, and dessert. Single people are more than welcome, and even friends can be 'coupled' in order to round out the group. If the main meal is already set, then others can bring wine, hors d'oeuvres or other refreshments. There can be several groups participating in the event at the same time, so anywhere from 20-50 people have participated in West Boylston's program at once. At the subsequent supper, the responsibility rotates: if you brought dessert the first time, you may bring the vegetable the next. If schedules permit, at the end of 4 months, everyone has had a hosting turn in the rotation, and then the groups rotate into other groups. Sometimes, in order to 'mix things up' or if not enough people have signed up, group rotations occur more quickly. "Sometimes we really have to do some active recruiting because our families are so busy, but once people get involved they are hooked and looking forward to the next one," said Michalak. Participants get together around 6:00 on a Saturday night, then start with a social hour, dinner and dessert. "Basically we just talk and have dinner. It's amazing that there's no agenda, but the conversation just flows," said Luella "Lue" Hawley -- one of the original coordinators of the event. "I've never been to one where the evening wasn't full of good conversation or I was surprised that it was time for the evening to end." New members are encouraged to sign up because it's a great way to get to know people; established members are encouraged in order to get to know the new members. The supper coordinators then mix up the participants so there is a balance of new and long-time members. "At normal church potlucks, there is a tendency for friends to sit together," said Hawley. 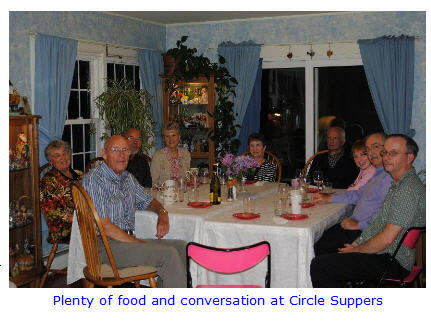 "These circle suppers ensure mingling with people who might not ordinarily sit with each other and results in newer people feeling welcomed and accepted." Michalak agreed. "I really do believe the time spent over a meal and casual conversation leads to a new relationship with people from the congregation that you never really knew before." "Sometimes you get to know spouses who don't normally go to church, or who may worship at a different church. It gives you a chance to get to know families and then find some common interests. Before you know it, you've become friends," said Hawley. "Yet, if we just saw these people at worship service, we might not have had the opportunity to get to know them better." "These circle suppers are about more than just sharing a dinner," she said. "It's about sharing lives and sharing faith. It's about feeling you are part of the church, part of the congregation, and part of the body of Christ." Lue and Karen can be reached at the church office at 508-835-4462 or administrator@fccwb.com.